The Center (http://www.thecenterpalos.org/) at Palos Park, IL hosted an Outdoor Women’s Retreat this summer. Tree stories were shared with some of the results below. Thank you Lois Lauer for sending these images. Back in June I reported on the buzz at The Center in Palos Park, IL. 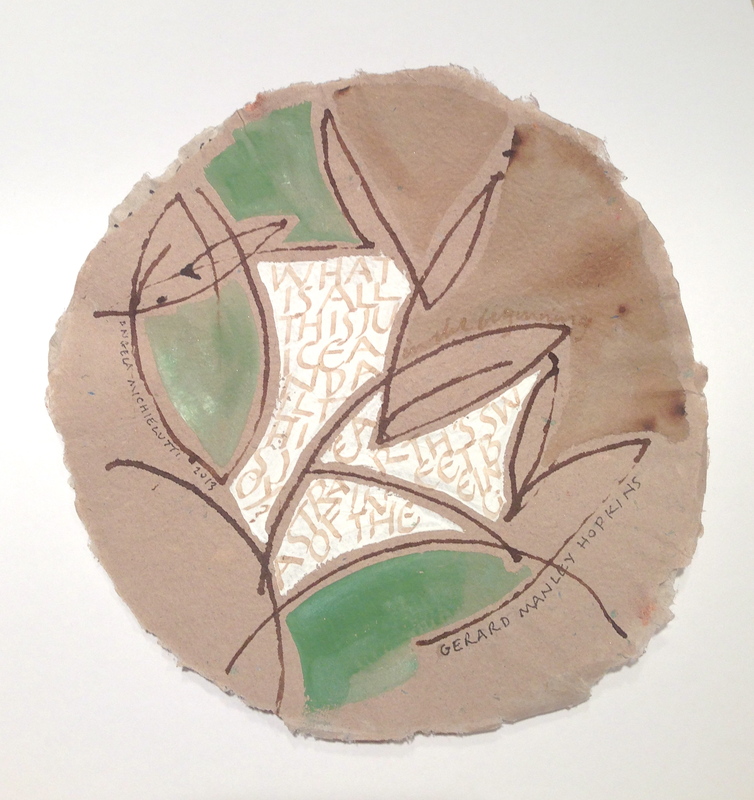 Lois Lauer stopped by this last week to deliver a multitude of unique and beautiful handmade paper rounds for the Treewhispers project. I wanted to share this update with the following letter she sent along with photos. 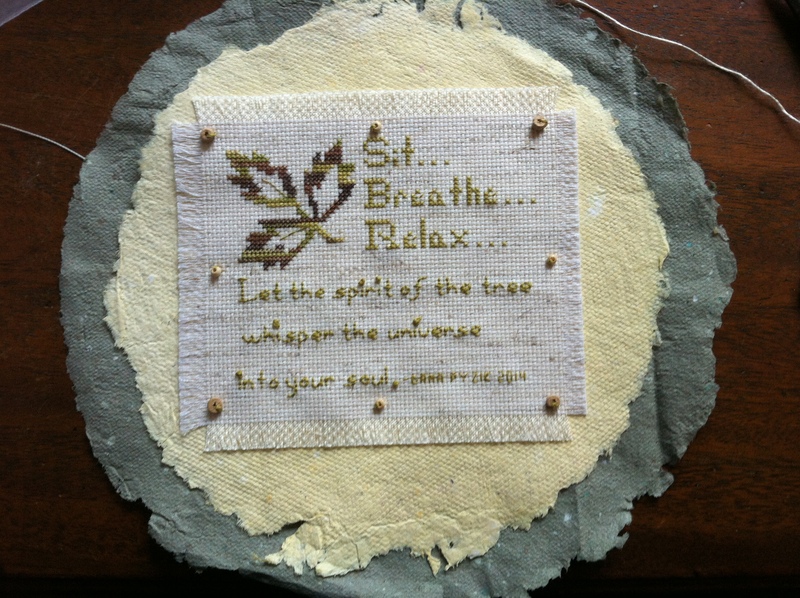 Many thanks to Lois who enthusiastically embraced the Treewhispers project and to all of those who contributed their time, talents and creativity. I cannot believe that it was 5 months ago already that you so graciously came down to the Center and helped us begin our Treewhispers journey. All summer I meant to write and send photos but the garden always called louder than the computer! I will try to catch you up on what has been happening! 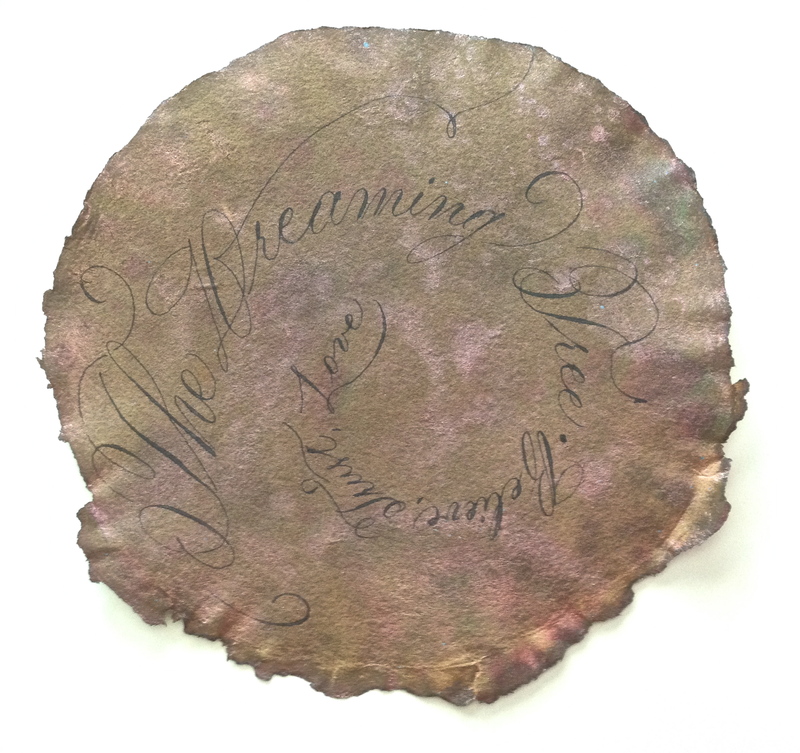 At Farm Fest in June we had a papermaking table and dozens of folks made Treewhispers circles and strung them on lines to dry in the sun and then came back later to write on them. Great fun! 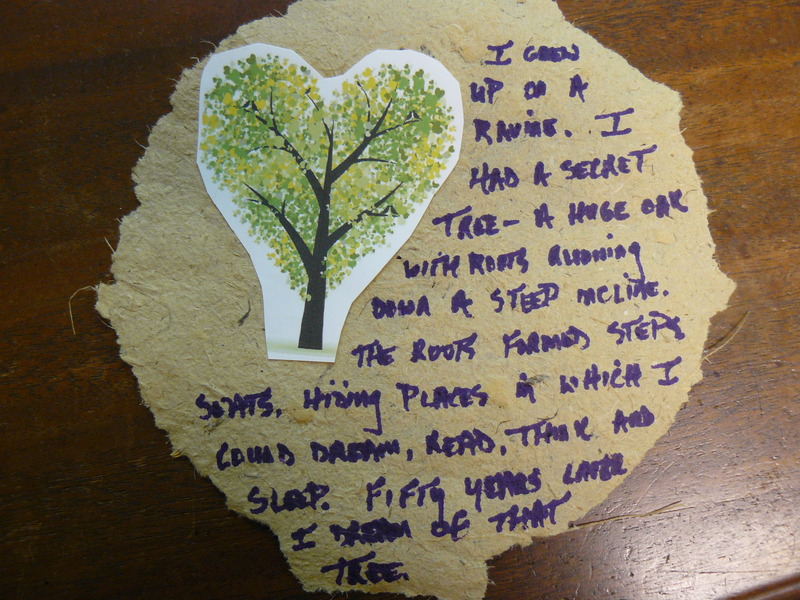 We had a staff picnic in June and all the staff participated in making paper and writing on their circles including our director, who wrote about his first kiss under an oak! 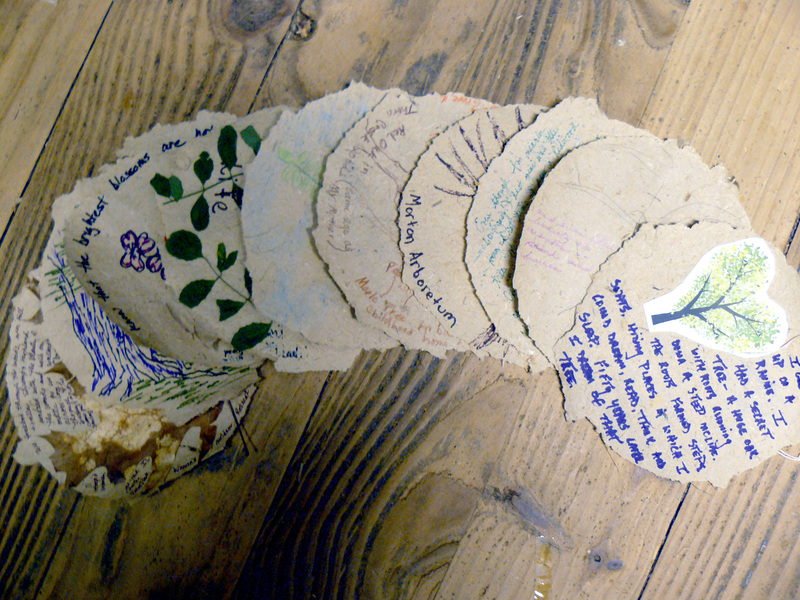 The Junior Farmer classes made paper this summer at the farm and wrote on their circle. The kids were young, so some just wrote one word thoughts about what they liked about trees, like “shade.” And the art students, both kids and adults, continued to contribute creative circles and a few arrived by mail after we printed an invitation to participate in the July newsletter. 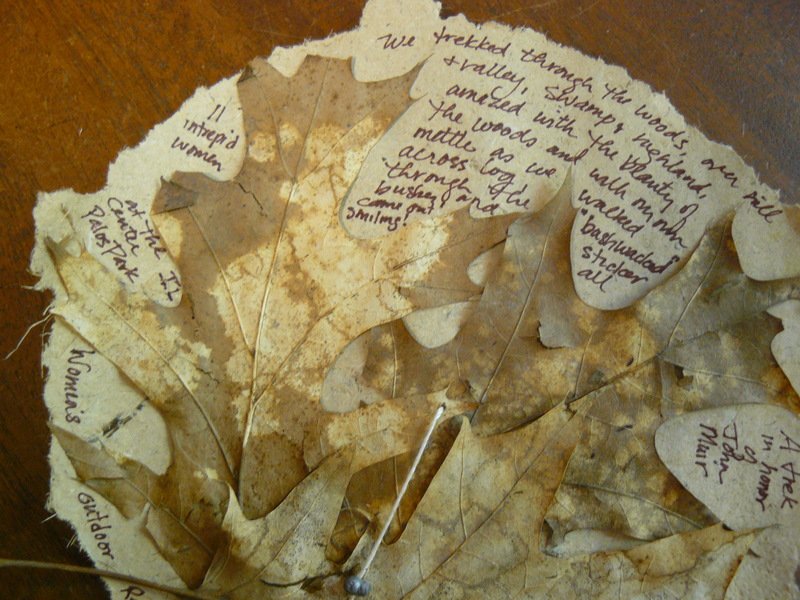 Additionally my family (ages 4 to 71) all made paper on our family vacation–more great stories! The “trees” looked so wonderful hanging in the Great Hall of the lodge this summer. I hated to take them down, but space became a problem with big fall activities. I’d always said we’d send them on to you after the summer. Amazingly, we ran out of the little weights, with only 3 extra discs! How did you ever plan that so well? So it may be time for our little forest to join your big installation of trees. The Treewhispers project has generated lots of enthusiasm all summer and I am, and we are, very grateful to you for creating this project and for bringing it to us! 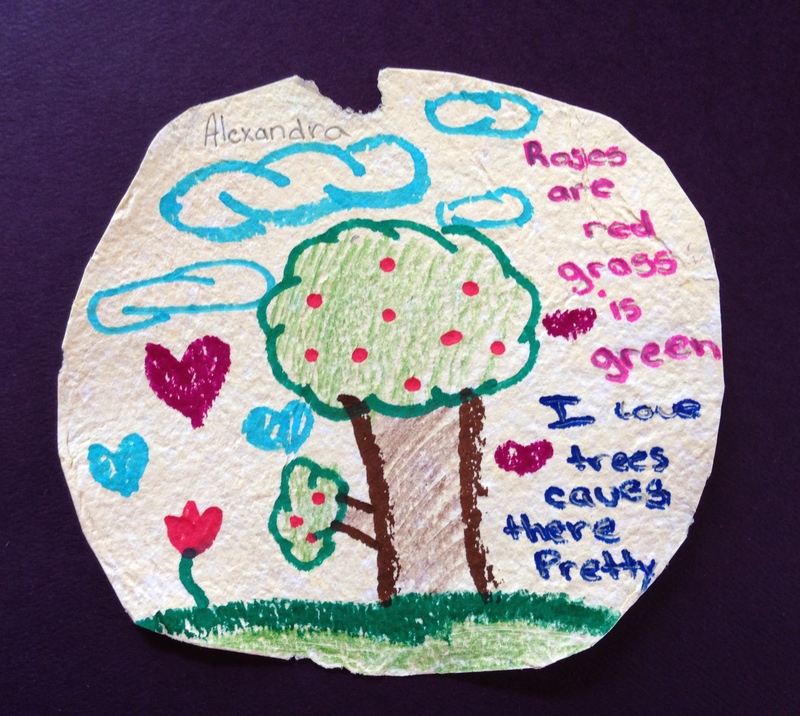 It’s such a beautiful blend of hands-on creativity, recycling old paper into something beautiful, and remembering and appreciating our connection with our dear tree friends. Plus it’s fun! And there’s something very speciall about being part of a project that has a life larger than just the one circle of paper you make. What a great project you invented. Thank you, Pam. We’ve loved being part of this. Lois, and the people and trees of The Center. 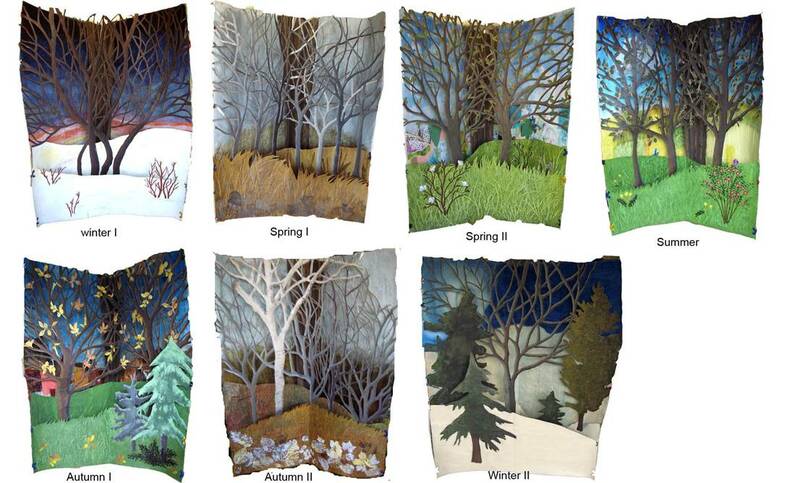 I wanted to share an incredible project relating to trees entitled “Seasons Rewound”—and the artists who created it, Barbara Pankratz and Barbara Johnston, both from Edmonton, Alberta, Canada. 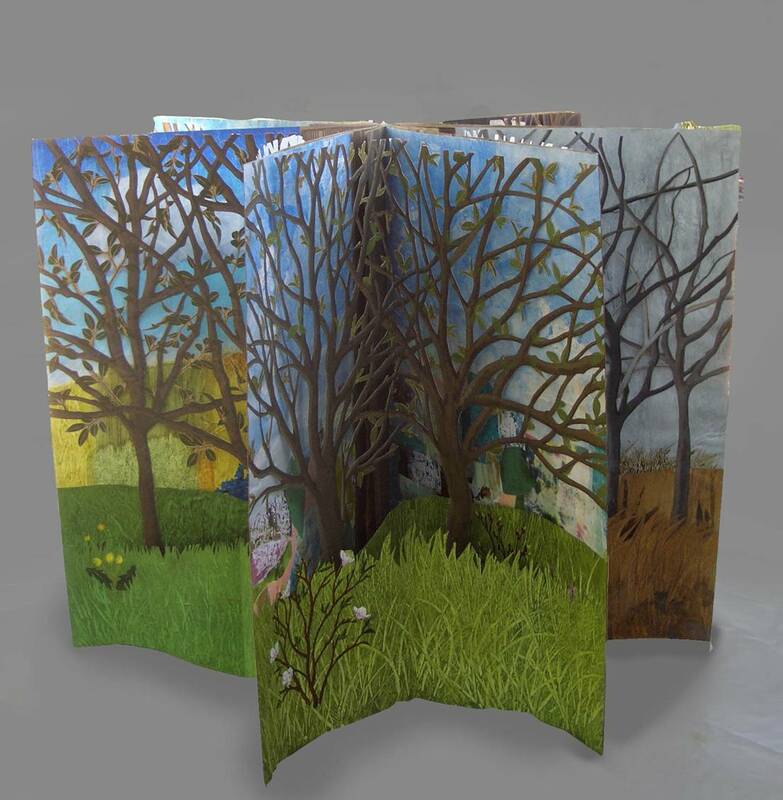 They described it as a book five feet tall with an open back page spread that is 7 feet across. They used paper called weed block that they were able to purchase in 25 feet rolls, 3 feet across. They built all the pages then drew, painted and cut. 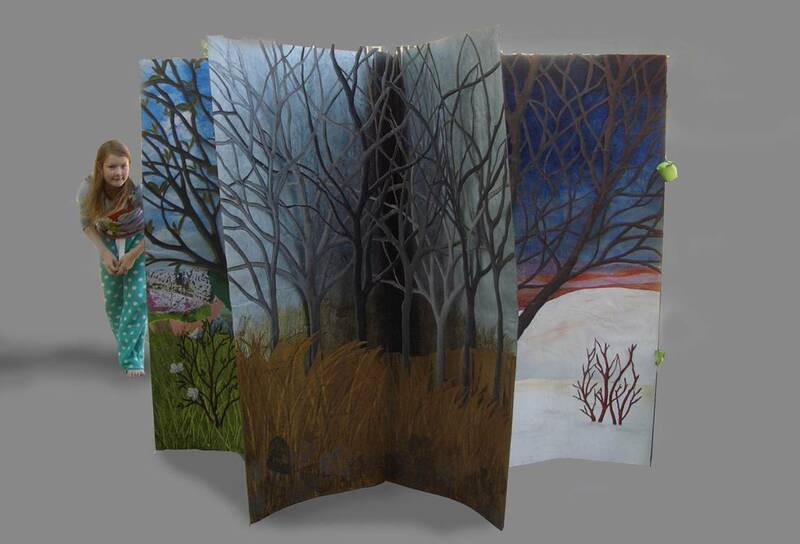 There are three layers, the background layer, the tree layer then a little layer in the front with seven openings. 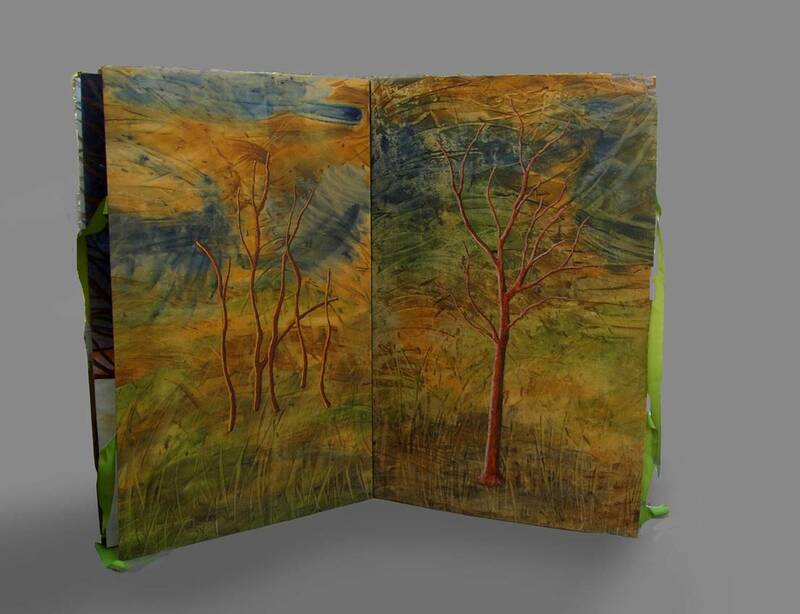 The covers are matt board covered with painted canvas. They mentioned that they spent one day a week for three years working on it. As they said it really was all about the process—they were not really concerned about the end product and they both felt the book literally made itself. It’s not too late to send in your tree story! 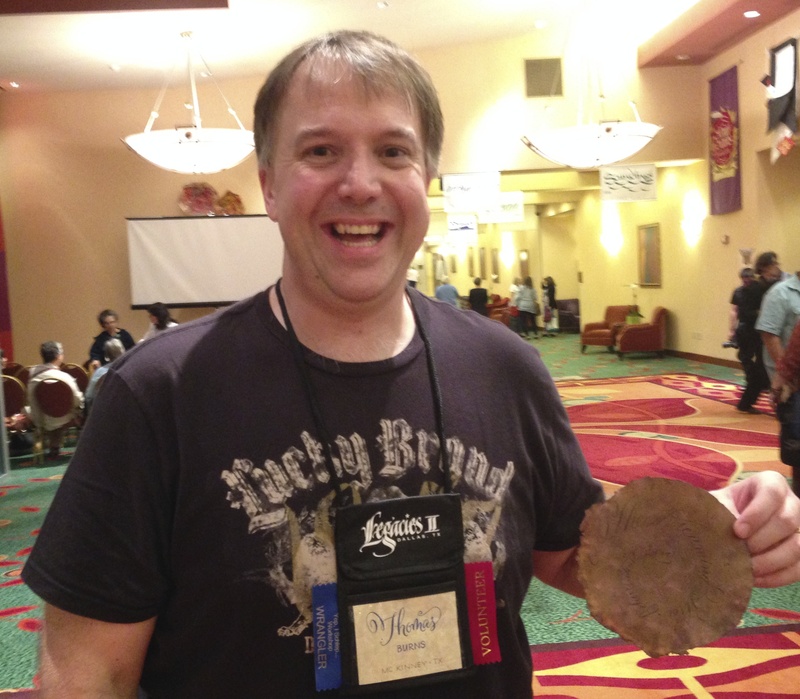 At the Legacies II Conference in Dallas, Tom Burns kindly shared his contribution to the Treewhispers project. Beautiful! Thanks Tom!!! Let the spirit of the tree whisper the universe into your soul.